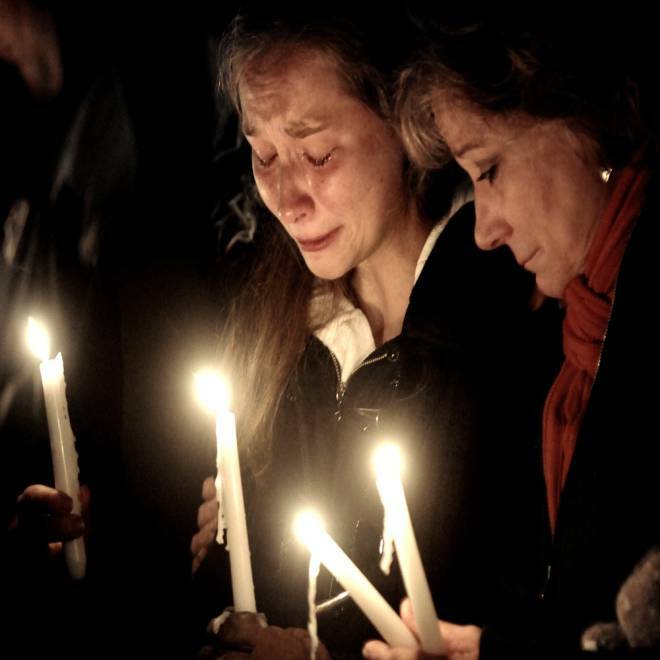 From left, Meghan Hoyt of Westboro, Elizabeth "Lizzi" Marriott's best friend, and Sue Gendron, also of Westboro, attend a candlelight vigil on Saturday night at the Bay State Commons for Marriott. A man has been charged with second-degree murder in Marriott's death though her body is yet to be found. The search for the body of a 19-year-old University of New Hampshire student was suspended Sunday ahead of the arraignment for a martial arts instructor who's been charged in her death, a prosecutor said. A ground and water search on and around Peirce Island in Portsmouth, N.H., was put on hold Sunday, Senior Assistant Attorney General Jane Young said, according to The Associated Press. She said officials will discuss the next "viable step" in the search on Monday, the same day 29-year-old Seth Mazzaglia of Dover is arraigned in connection with the death of Elizabeth "Lizzi" Marriott. Mazzaglia was charged Saturday with second-degree murder, but Marriott's body has not been located. Marriott was from Westborough, Mass., and had been living with an aunt in Chester, N.H., and commuting to the university in Durham. Assistant District Attorney James C. Vara would not comment on how cooperative Mazzaglia had been after his arrest or how investigators were led to the Peirce Island. The island which is about 100 feet off the coast of Portsmouth and is connected by road to the mainland, the Boston Globe reported. Mazzaglia and Marriott met last summer when both were working at a Target store in Greenland, N.H., Marriott's aunt, Rebecca Tyning, told the Worcester Telegram & Gazette. Young confirmed they knew each other, but she declined to say whether they worked together. "There was familiarity between them," Young said. Marriott, a marine biology major, was last heard from on Tuesday. She attended class that night and made plans to visit friends in Dover. Her cellphone was used that night, according to fliers family members posted around town. Her car was later found in a campus parking lot in Durham. Friends and family have described Marriott as a fun-loving, trusting young woman with a wide circle of friends who was active in chorus and a prom queen in high school. She loved animals, volunteered at the New England Aquarium and was helping put herself through school by working at Target, friends said. “This evil act will not define Lizzi,” the Rev. John Taylor, pastor of the First United Methodist Church in Westborough, told his congregation on Sunday, the Worcester Telegram & Gazette reported. At a vigil in Westborough on Saturday night, her father choked back tears while speaking to the hundreds who had gathered, calling his daughter an angel and saying she's now in heaven. Mazzaglia graduated from the University of New Hampshire in 2006 with a degree in theater. Friends have said they were shocked to hear of his arrest. A person named Seth Mazzaglia was listed in a short newspaper article as one of 18 graduates last December from the Portsmouth Police Department's Citizens Police Academy, a program that aims to bring citizens closer to police and raise public awareness about crime prevention techniques. The academy's director, Sgt. Tom Grella, could not be reached for comment Sunday. Mazzaglia was being held at the Strafford County House of Correction in Dover on Sunday. It was unclear whether he had an attorney, but Young said she expected him to have one appointed in time for Monday's hearing. Video: Musical prodigy, 7, next Mozart?